Plan a road trip to Mammoth Lakes with a side trip to Death Valley National Park, where you can experience the lowest point in North America. The park is also home to rugged desert landscapes, scenic hiking trails, and unique wildlife. Death Valley is home to the lowest point in the United States, Badwater Salt Flats, at 282 feet below sea level. Despite its reputation as a barren desert, Death Valley is home to 50 plants found nowhere else on earth. Park entrance fees are $20.00 per car for a seven day pass. 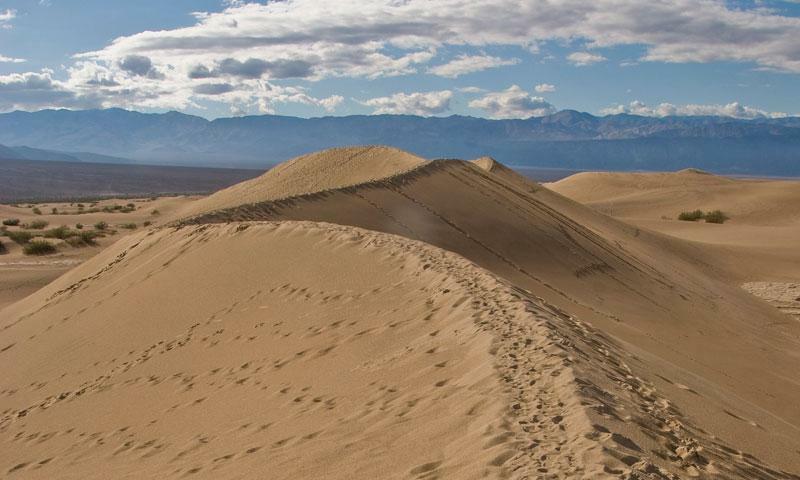 At 3.4 million acres Death Valley National Park is the largest park in the continental United States. Despite its reputation as a barren desert, Death Valley NP is actually home to many unique plant and animal species (the valley is home to over 1,000 plant species. 50 of those are found nowhere else in the world), and offers visitors a chance to experience many types of terrain, ranging from the Badwater Basin (-282 feet) to Telescope Peak (11,049 feet). The park is also home to unique attractions such as Scotty’s Castle. Summer brings blazing temperatures in Death Valley, so while the park is open year round, autumn and spring, with their mild temperatures and clear skies, mark the best times to visit. Furnace Creek, Mesquite Spring, Emigrant, and Wildrose campgrounds are open all year. Sunset, Texas Spring, and Stovepipe Wells are open from October to April. Thorndike and Mahogany Flat are open March – November. Emigrant, Wildrose, Thorndike, and Mahogany Flat are free. Stovepipe Wells, Mesquite Spring, and Sunset cost $12.00 per site. Texas Spring is $14.00 per site. Furnace Creek is $18.00 per site. All campsites are offered on a first-come first-served basis, with the exception of Furnace Creek, which is available for reservations during the camping season of October 15th through April 15th. Vehicle Entrance Fee: $20.00 for 7 days. Individual Entrance Fee: $10.00 for 7 days. Annual Pass: $40.00 for one year. Scotty's Castle, Living History, and Lower Vine Ranch Tour Fees apply. Rocks here have been stained a variety of colors from the minerals within. The formations are thought to resemble an artist’s palette. This is the main park visitors center. Here you’ll find a bookstore, an auditorium, park orientation programs, and the Death Valley Museum with exhibits explaining both the natural and human history of Death Valley. Open 8am to 5pm year round. Located in the Grapevine Canyon in the far northern section of Death Valley, Scotty’s Castle is a unique mansion built for an eccentric engineer in the early 1920’s. Tours are available and last approximately 50 minutes. Start at the Badwater parking lot, and follow the path out to the lowest point in the United States, at 292 feet below sea level. This walk can be as long or short as you like. The flats are five miles across. This two mile hike (round trip) begins at Darwin Falls parking area and treats visitors to year-round waterfalls and lush vegetation. Because of Death Valley’s remote location, clean air, and cloud scarcity, it is an excellent place for star gazing. From Mammoth Lakes, take US-395 south for 98 miles. Turn left at CA-136 E, and continue here for 17 miles. Then merge onto CA-190 for 85 miles. Follow signs to find the park entrance. Along the way, make time to see Mt. Whitney (elevation 14,505’), the highest peak in the continental United States.